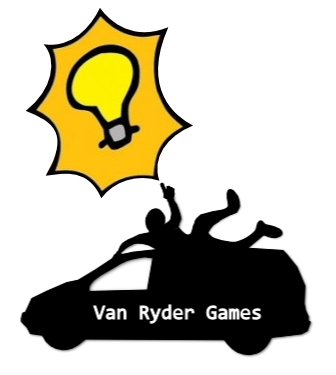 A bright idea from Cardboard Edison and Van Ryder Games! It’s time for another board game review. But this is more of a board game preview. On Monday I had the privilege of meeting Chris and Suzanne Zinsli, the designers of Tessen. They happened to be in town on a drive halfway across the country. I didn’t have much time with them, but I was able to learn Tessen. And I was able to beat Adam Buckingham at it! So today I Review/Preview the game and I recommend you back the project on Kickstarter! Normally I provide 3 “likes” and 3 “dislikes” and then an overall rating. I’m not doing that today since this is more of a preview. Ultimately you should decide for yourself if you think this game is worth backing. Though if you continue reading I’ll tell you that it’s worth backing. So I guess I’m a bit of a hypocrite. Oh well. Disclaimer: I was not contacted to provide a preview. I am previewing the game because I really enjoyed it. 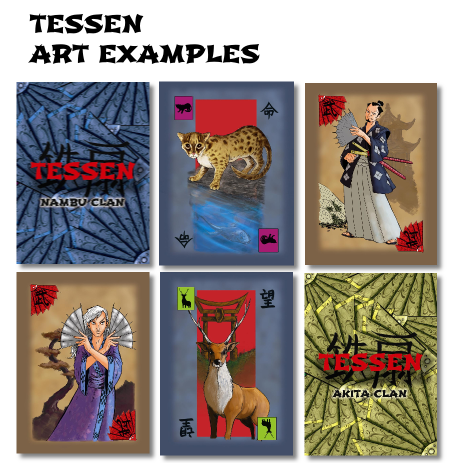 Tessen is a fast playing, real-time card game for two players. One player will represent the Akita clan and the other player will represent the Nambu clan. The object of the game is to gather sets of animals. To do that you’ll be playing cards quickly from your hand. If you can stack three or more of a kind of animal then you can “save” them into your save pile. The player with the most cards in their save pile at the end of the round wins that round. The player decks are composed of eight different animals and two different warriors. There are 4 of each type of animal, 9 warriors, and 1 super warrior. Each player shuffles their deck and places it face down in front of them. When both players are ready they’ll say, “Tessen!” and the battle will begin. Players will draw cards from their deck into their hand and begin laying them on the table. There is a 5 card hand limit, so be sure that you don’t draw too many. I made this mistake a few times and I’m sure Adam will want a rematch where I don’t accidentally cheat. When you’ve got cards in your hand it’s time to start playing them to the table. You have five spots you can play cards in front of you. Each spot can only hold one type of animal. So you’ll be playing sets of the same animals on each spot. If any pile gets to three or more cards, then you can say, “Save,” and move that pile into your save pile. The Warrior cards allow you to attack or defend. If you’ve noticed the other player stocking the same animal type, you might want to attack their pile. To attack just announce that you’re attacking and play your warrior card at their pile. They cannot take any other actions until they’re resolved the attack. If they want to use a warrior to defend and repel the attack they may do so. If they don’t have a warrior then they must let you take the cards. You can add those cards to your pile. If you cannot add the cards to any of your piles, then they go into a discard pile that your opponent can use to draw from. The super warrior card basically counts as a double warrior. So to defend against a super warrior attack would take two warriors or your own super warrior. Once one player has reached the end of their deck they announce, “Tessen,” and the round is over. Whoever saved the most animal cards to their save pile wins the round. They will then have to start the next round without one of their warrior cards. The game winner will be the first player to win three rounds. I am always looking for games that I’ll be able to play with my wife. This is definitely one of those games. This game is very accessible. It is also very fun. I was trying to play my cards as quickly as possible and I think I did alright at that. The fact that individual rounds only take a few minutes means this game plays pretty quickly. It’s a really solid game design that is really enjoyable to play. What I liked the most was the emotion it brought up in me. I really felt like I was battling against Adam. I was trying so hard to beat him. And when I heard him saving a bunch of cards I got anxious. I think to have a game draw out such emotions from a player is really cool. What I disliked the most is that since this is a real-time game I think it suffers from player’s abilities a little. You have to be quick to draw cards. You have to be quick to comprehend cards. You have to be quick to play cards. And you have to be quick to see what your opponent is playing. So I think that as players play more and more they’ll be able to hone their Tessen skill’s such that new players may not stand a chance against them. Overall this is an excellent game. I really enjoyed playing it and I highly recommend it. For the low price of $12 you can receive a copy and help Van Ryder Games produce the awesomeness. Go and back the project on Kickstarter today! Posted on August 9, 2013, in Board Game Reviews, Board Games, The Boards and tagged animal cards, board games, card game for two, cardboard edison, kickstarter, Tessen, van ryder games. Bookmark the permalink. 2 Comments. Wait a sec… I feel like there’s a fairly significant revelation here. I’m feeling both betrayed and vindicated right now. I was hoping you wouldn’t read today’s article. You are justified to request a rematch at GenCon!